Men knew their mothers only, not their fathers. It may only be a mythological tale but it is nonetheless revealing that, even 2,000 years ago, a state of chaotic and feral amorality in society – indeed, a non-society – was equated with men being absent from children’s upbringing. Yet for decades we have had feminists – not to mention their loathsome political cronies and the opportunistic vultures known as family solicitors/lawyers – eagerly trying to bring this situation about in reality, hurriedly removing fathers from their families and demanding the government subsidise – even encourage – single motherhood. Just to bring things up to a more contemporary date, I recall seeing a programme about the worst buildings in Britain, and amongst them was Park Hill Flats in Sheffield (above). Although it concentrated on its subject’s architectural merits (or lack thereof) the programme did take into account other factors, such as the quality of life in such buildings, and there was little quality about life in the Park Hill Flats; strewn with rubbish, sprayed with graffiti, plagued with muggers and littered with…well, litter. It’s a big sprawling concrete shithole. I went to Sheffield once and caught sight of this place from the taxi. It scared the willies out of me. It’s hideous. And it’s full of single mothers. There was an interview with the local GP who mentioned the health problems featuring single mothers. A local social worker mentioned that “most of the people here are single mothers” and the images shot for the programme were replete with young women – mostly aged sixteen to twenty – pushing prams, or women in their late twenties with moody adolescents…single mothers everywhere. No sign of any fathers. There were some interviews with a few couples but these were invariable older people who were as depressed as hell and talked about the decline of the neighbourhood. 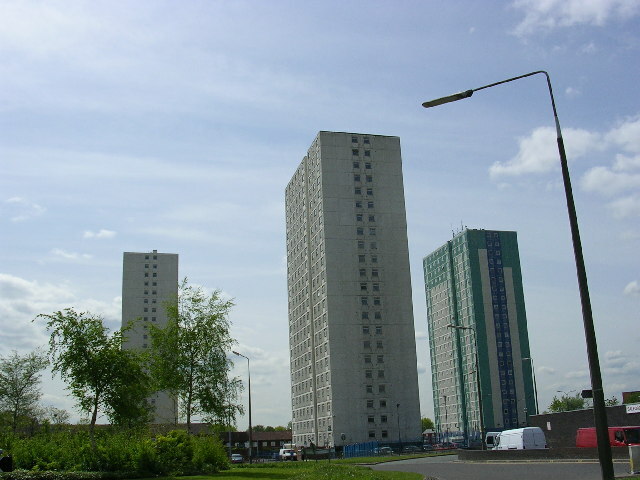 High rise tower blocks have long since had a bad reputation in Britain as being areas of high-crime and general anti-social behavior. The only suggestions as to why criminal and loutish behaviour seemed to flourish just because people are living a few floors up have been about how it’s so stressful for people to be cooped up in high-rises. Yet this doesn’t explain why high-rise apartment blocks in other countries, like the US and Japan, do not generally have the same association with anti-social activity. The fact is, in the 1950s and 1960s when most of these ‘commie blocks’ were built, the British government made them Social Housing, available for those on benefits. This soon linked hands with the results of feminism – single-mother households – and as these single mothers ended up populating high-rise tower blocks. In other (mostly non-European) countries high-rise residential buildings were invariably private, and so attracted working singles, couples or proper (i.e. two parent) families. With fathers around the children there were less likely to become slobs, junkies and teenage single-mothers. An army of single mothers and their brats can turn a neighbourhood into a crime-ridden hellhole quicker than anything else. This is beginning to happen to the entire country as the proportion of babies born out of wedlock in the UK hits 40%. Now, either feminists do not know how devastating it is for a society to abolish fathers, in which case they are primitive simpletons, or they are aware of this but go ahead in their drive to abolish fathers anyway, in which case they are malicious to a point beyond the comprehension of any moral being. Either of these scenarios backs up the obvious conclusion that no society can be healthy so long as feminism flourishes and is taken seriously. It has to be stomped and ridiculed into oblivion. This entry was posted on Monday, July 2nd, 2007 at 1:03 pm and is filed under feminism, matriarchy and single mothers. You can feed this entry. Responses are currently closed, but you can trackback from your own site.